This Saturday and Sunday in the Malibu mountains, hundreds of California residents, cannabis advocates and entrepreneurs will attend Emerald Exchange, an upscale cannabis wellness festival celebrating sungrown flower and the new cannabis culture. 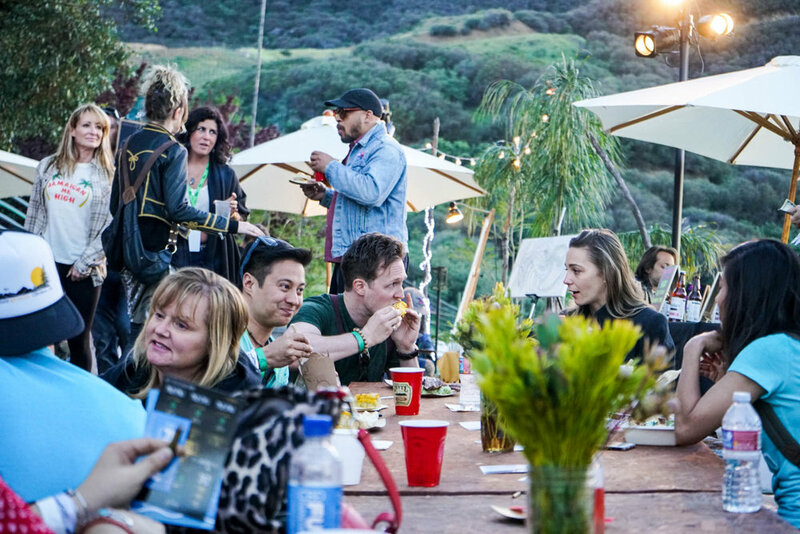 Emerald Exchange brings together industry leaders, companies and consumers for a weekend of panel discussions, infused pop-up restaurants, food and drink pairings, cannabis sampling, music and art, massages and more, with a focus on wellness and community. Join us at our favorite cannabis event and use the code "cannabisfeminist" for a special discount. To prepare for this weekend's festivities, we want to share an interview with Emerald Exchange co-founder and ultimate Cannabis Feminist, Jessica Cure. How did you get involved in cannabis industry? I have an autoimmune condition and spent a few years on prescription medication that helped in certain ways but really started to affect me negatively. I was once hospitalized for two months in isolation and was put on strong narcotics and opioids and spent a few years really struggling before I discovered the benefits of cannabis. Cannabis started as a tool for the pain and getting off of pills and then it led me down the road to health. In addition to cannabis, I also found the power in breathing and meditation. I went through my life and made sure I had all the keys to health: clean water, air, food and relationships. I realized I didn't have healthy relationships so I went back to my subconscious beliefs and shed different layers to bring myself back to health. Once I started eating clean and understanding my vibration I understood things so differently and was able to transform. Now I can finally listen to and follow my intuition. If I look back I could visually tell you every single sign that got me to where I am now. I lived on a permaculture farm and realized how amazing permaculture is but i didn't love being on a farm. I said "I put myself here" and really consciously understood how your thoughts create your reality. So many people are in "get through the day" mode. When I was on the pills I knew I didn't want to be taking them but I knew I couldn't get through the day without them. And that's how people run around. It took me awhile to realize that taking time for your own practices will make you more productive and capable. I joined the Emerald Exchange team to build out the wellness aspects of the festival. My company, Cure Designs, is all about ritual building, sacred spaces and different kinds of lifestyles and I think it brings all of these things together to educate about not just cannabis but all these healing modalities. I believe we can utilize the plant to achieve a higher vibration. How did Emerald Exchange start? The original founders of Emerald Exchange, Justin Calvino and Michael Katz, have a history of farming in Mendocino County and were trying to pass a bill to protect smaller farms. Brooke, Justin's neighbor, started working with them to host small-scale cannabis farmers markets in Southern California. The vision was to bring together farmers who need access to bigger markets and help them get set up with large-scale vertical licenses. It was started out of a desire to build something different by a group that fundamentally believes cannabis is a plant medicine and can build community. When you meet the farmers, you can see their authenticity. I was able to maintain and scale Justin's vision and make it sustainable. We bring the LA wellness vibe with a focus on community. We make sustainable decisions when it comes to design by using less power, not offering straws and lids, and avoiding plastic in alignment with the festival tradition of "leave no trace." Festival integrity is really important to us. Ultimately we want to create something that you are excited to bring your mom to, that is comfortable for everyone. Maybe you have only ever tried a CBD tonic at Erewhon, or maybe you want to learn about juicing raw cannabis or the benefits of raw non-psychoactive cannabis. We will have clothing vendors that use plant dyes and a workshop on cannabis-friendly dating. The festival is a healing experience. Can you talk about the standards? We focus on northern California sungrown flower. We have an application process where we ask vendors for their farming practices to make sure they will fit into our community. Many of them use regenerative agriculture and permaculture, as well as plant diversity so they don't have to use pesticides. We want to inspire companies to meet our standards and constantly be improving. I think sungrown cannabis just has a vibration to it; it's something intended in nature. Emerald Triangle just happens to be one of the best places in the world to grow sungrown well because of the weather. It showcases the importance of sun and soil and farming with love and intention. You can feel that human love went into it. The best part about Emerald Exchange is that you can go up to any booth and ask the cultivators questions about their practices and they will be transparent. We make these standards a part of our culture. I'm most excited about everything. People tell me that Emerald Exchange changed their life or that it is the best representation of cannabis as wellness. We build it by using each other's strengths and harnessing the power of the community. The community has created this event. I'm really excited to see everyone come together to create this for the larger community. When I stand back and watch it all get built I get chills. I feel so proud to see everyone connecting in such a beautiful and authentic way.